As Andrew Spiegel, Esquire (Chief Executive Officer) explains, "We presently have two [inflatable colons] that we use for conferences, special events and for all of our 5K runs around the country. Last week we launched our website to sell these giant inflatable colons as a way to raise awareness about colorectal cancer. We sell them through a partnership with Landmark Creations, and we expect to start taking orders soon." Why go the extra mile? 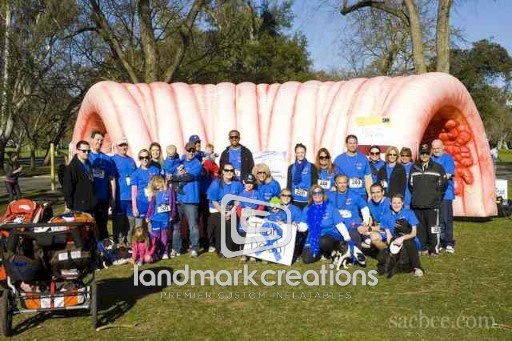 Most organizations would be satisfied to use a single inflatable colon at their health fairs, trade shows, expos and races… and the Colon Cancer Alliance does that. But they wanted to extend the scope of their reach and show just how passionate they are about preventing the disease from taking even one more life. "This is a disease (part of the body) that many don't want to talk about or discuss with their doctors, and as a result, colorectal cancer is the second-leading cause of cancer deaths in America. About 50,000 people die each year from the most preventable major cancer, so we want to encourage people to become comfortable in discussing this with their doctors and get preventative screening tests."